“Chaos” has left the building. As the uproar over James Mattis’ resignation subsides, the question of his successor remains open. Many considerations will guide President Donald Trump as he weighs his options to lead the Department of Defense. At this moment in our history, one thing should be foremost in the president’s mind: In an era of renewed great power competition, America needs a navalist as its new secretary of defense. Despite all of the politically fueled hysteria about Russia and the even more irrational fear of a third-rate Iran, there is only one nation that offers a potential long-term strategic challenge to America: China. The Trump administration has focused on China from the moment it took office, as reflected in trade policy, diplomacy and the 2017 National Security Strategy. Economic policy, information operations and diplomatic skill are likely to matter far more than raw military strength for containing China. Nonetheless, the United States Navy is the primary hard power tool for ensuring that China does not achieve primacy in the Pacific and threaten vital U.S. national interests. America is a maritime nation with no legitimate enemies in its entire hemisphere. Naval preeminence is our clear military priority, even if it must come at the expense of the Army’s budget share and force structure. The U.S. Navy remains the only true blue water fleet on the planet, but it is in increasingly parlous shape. The Fat Leonard scandal and the pair of fatal collisions in the Pacific’s 7th Fleet in 2017 exposed cultural rot at the heart of the Navy. As many as 60 admirals are receiving scrutiny for potential ethics violations, and 17 sailors are dead. Yet these humiliating incidents are only the tip of the iceberg. Though the Pentagon is bloated and we have an army that can’t make its recruiting goals, it seems clear that the U.S. Navy is too small to meet the demands placed on it. A 2015 study by the Government Accountability Office found that the Navy fulfilled only 44 percent of all combatant commander requests for support. Meeting all of them would require an additional 150 ships. The accidents involving the destroyers Fitzgerald and John S. McCain were predictable outcomes of this overstretched and overworked fleet. Most of the blame for our incredibly expensive shrinking Navy can be laid at the feet of a decades-long procurement disaster. The littoral combat ship, intended to fill out much of the surface force, is the greatest embarrassment, but far from the only one. Derided by sailors as the “little crappy ship,” the LCS, the Navy has admitted, would not survive sustained naval combat. Lawmakers are set to fund a 33rd, 34th and 35th littoral combat ship, three more than the 32-ship requirement set by the Navy. But the sensors destined for those ships are another story. 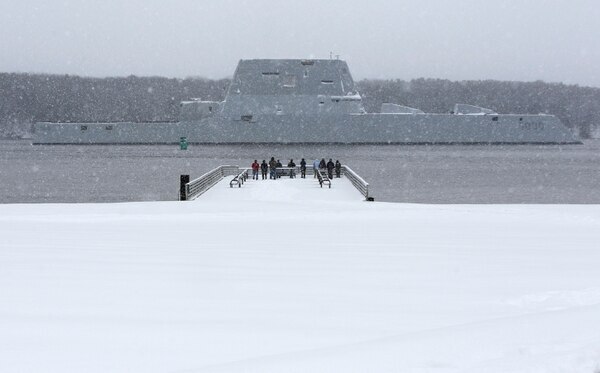 The odd-looking Zumwalt-class destroyer boasts naval stealth and significant power generation, but ballooning costs have killed the ammunition for its gun and reduced the overall ship buy from 32 to 3 — making the Zumwalt an extremely expensive technology demonstrator instead of a combat workhorse. The new Ford-class aircraft carrier’s price tag has risen to more than $13 billion, even as the aircraft carrier Gerald R. Ford battles problems with its propulsion system and the new electromagnetic aircraft launching system. President Trump took notice. All of this for a class of ship that may already be a white elephant, suited only for wars of the past, not the future. At the root of the Navy’s problems is its agenda of “transformation,” in which dedication to functional fighting ships was sacrificed on the altar of big technological leaps forward. Aside from the Arleigh Burke-class destroyers, which entered service in 1991, we have been unable to produce even a single capable, affordable surface combatant ship since the fall of the Berlin Wall nearly 30 years ago. There is a chance the president will keep acting Defense Secretary Patrick Shanahan and seek his confirmation. This would be a mistake, for the obvious reason that Shanahan has no military or foreign policy experience. It also doesn’t help that there is a growing perception Shanahan is favoring his former employer, Boeing. Deputy Secretary of Defense Patrick Shanahan could suddenly find himself in the spotlight, following Defense Secretary Jim Mattis' announced departure. An obvious choice for defense secretary, and a man who has received some boosting of late, is former Marine and former U.S. Sen. Jim Webb. Webb is a longtime opponent of our misconceived interventions in the greater Middle East, and an equally ardent China hawk. He famously resigned as secretary of the Navy because President Ronald Reagan wouldn’t increase the Navy to 600 ships. What fewer people know is that Webb’s first book, written as a law student, was on U.S. strategy in the Pacific. Another strong option would be Rep. Mike Gallagher. The Wisconsin Republican has stood out in Congress as a dedicated and persistent advocate of American naval power. His résumé as a Marine officer and as a national security thinker compares favorably to that of Secretary of State Mike Pompeo, a man elevated from the House of Representatives to a pair of key Cabinet posts. In his resignation letter, Mattis stressed that President Trump deserves a secretary of defense who shares his views and priorities. With the announced pullout of U.S. troops from Syria and a likely drawdown in Afghanistan, the president appears to be serious about ending U.S. participation in protracted small wars and instead marshaling U.S. military power to deter great power conflict. America should rebalance its military, cutting the large land forces we don’t need and prioritize the Navy that is critical to our national security. The man who called for a 350-ship Navy on the campaign trail should find a new secretary of defense who will fulfill that promise. Gil Barndollar is the military fellow-in-residence at the Catholic University of America’s Center for the Study of Statesmanship, and he is a fellow with Defense Priorities. He served as a U.S. Marine Corps infantry officer from 2009 to 2016.